Show a few examples of pure functions. It also tries to simplify the pure function definition, and shares a tip on how to easily identify many impure functions. Because that definition uses the term “pure functions,” it’s important to understand what a pure function is. I gave a partial pure function definition in that chapter, and now I’ll provide a more complete definition. Its result can’t depend on reading any hidden value outside of the function scope, such as another field in the same class or global variables. It cannot modify any hidden fields outside of the function scope, such as other mutable fields in the same class or global variables. 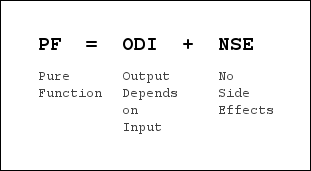 It cannot depend on any external I/O. It can’t rely on input from files, databases, web services, UIs, etc; it can’t produce output, such as writing to a file, database, or web service, writing to a screen, etc. A pure function does not modify its input parameters. A pure function is a function that depends only on its declared input parameters and its algorithm to produce its output. It does not read any other values from “the outside world” — the world outside of the function’s scope — and it does not modify any values in the outside world. You can represent that as shown in Figure [fig:equationHowPureFunctionsWork]. A simpler version of that equation is shown in Figure [fig:equationHowPFsWorkSimpler]. In this book I’ll generally either write, “Output depends on input,” or show one of these images. Another way to state this is that the universe of a pure function is only the input it receives, and the output it produces, as shown in Figure [fig:universeOfAPureFunction]. If it seems like I’m emphasizing this point a lot, it’s because I am(!). One of the most important concepts of functional programming is that FP applications are built almost entirely with pure functions, and pure functions are very different than what I used to write in my OOP career. A great benefit of pure functions is that when you’re writing them you don’t have to think about anything else; all you have to think about is the universe of this function, what’s coming in and what’s going out. Given the definition of pure functions and these simpler mantras, let’s look at some examples of pure and impure functions. I refer to these as “methods” because they are defined using def in the package object math. However, these methods work just like functions, so I also refer to them as pure functions. Conversely, the following functions are impure. Date and time related methods like getDayOfWeek, getHour, and getMinute are all impure because their output depends on something other than their inputs. Their results rely on some form of hidden I/O. Methods on the scala.util.Random class like nextInt are also impure because their output depends on something other than their inputs. Because println is such a commonly-used method, you already know that it writes information to the outside world, but if you didn’t know that, its Unit return type would be a terrific hint of that behavior. Because it takes no input parameters, the mantra, “Output depends only on input” clearly can’t apply to it. If a function has no input parameters, how can its output depend on its input? If a function has no result, it must have side effects: mutating variables, or performing some sort of I/O. While this is an easy way to spot many impure functions, other impure methods can have both (a) input parameters and (b) a non-Unit return type, but still be impure because they read variables outside of their scope, mutate variables outside of their scope, or perform I/O. Now that you’ve seen the definition of a pure function, I’ll show some problems that arise from using impure functions, and then summarize the benefits of using pure functions.